The checkered shirt is a versatile classic and staple of every great wardrobe. Whether it’s a dress shirt, linen shirt or flannel shirt, you are guaranteed to look incredible in a tailor made checked shirt. Checkered shirts come in many styles, from small intricate checks to large window-pane checks. As a general rule, smaller checks are more suited to formal occasions. Browse our hand-picked selection of recommended designs and find inspiration for your new made to measure checkered shirt. 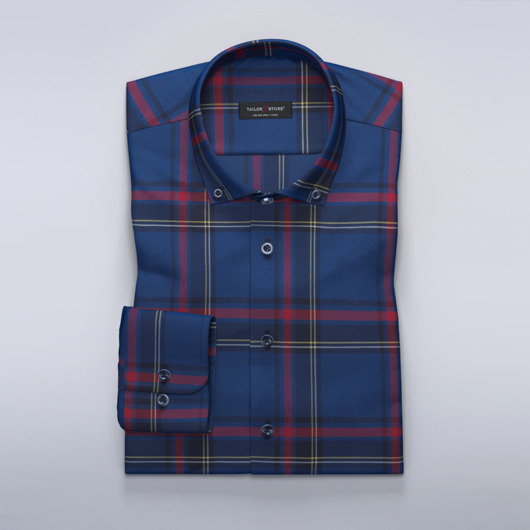 Whatever your preference you can personalise any detail of your tailored checkered shirt in our easy to use shirt design tool. Change colours, go long sleeve or short, customise your collar, create your one of a kind checkered dress shirt today. Do you know all of the checkered patterns? The Gingham pattern dates back to the 1700s. At that time it was blue and white, the most popular color choice available. What matters to Gingham today is that all squares have uniform equal sides. In a Gingham pattern there are three tones of checks, white, a contrast colour, and then a final blend of the white and contrast colour. 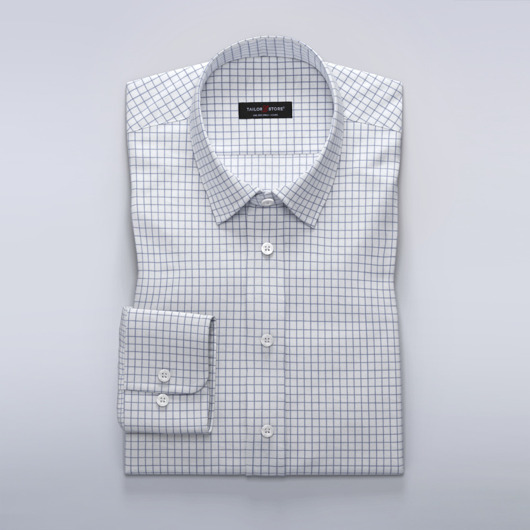 Windowpane checks are larger squares commonly featured on Oxford shirts, or cotton dress shirts. Windowpane checks are a great choice for relaxed occasions like a family gathering or night it the cinema. Graph checks are small subtle squares. These thin checked lines criss cross into an elegant and sophisticated checkered pattern. The interconnecting lines have a very similar appearance to graph paper, hence the name graph checks. Houndstooth checks consist of intricate angled shapes sitting within interconnecting checkered lines. Houndstooth is a stunning elegant checkered pattern, most commonly worn in simple black and white, but available in a wide range of colours at Tailor Store. Browse our wide range of Houndstooth checkered shirts today. Tattersall is a checkered pattern consisting of thin, regular stripes in alternating colors that are repeated both horizontally and vertically. The stripes that create the tattersall pattern often have two different colors and are usually darker than the background color. For example, two different blue colors form a crossed pattern against white background for a stylish Tattersal shirt. Mini-check is a pattern consisting of very small and even squares. The pattern usually consists of a color combined with white and is often similar to the Gingham checks, except that these are much smaller. This pattern is more casual than stripes, but more formal than shirts with larger squares. Tartan checks are slightly larger squares in several colors. The distribution of the colors in the square is always symmetrical. Tartan checks have a rugged charm, perfect for flannel shirts and afternoon walks in the country.